PwC released its 2015 Africa Capital Markets Watch publication today, which analyses equity and debt capital markets transactions that took place between 2011 and 2015 on exchanges throughout Africa, as well as transactions by African companies on international exchanges. Equity capital markets (ECM) transactions included in the analysis comprise capital raising activities, whether initial public offerings (IPOs) or further offers (FOs), by African companies on exchanges worldwide, as well as those made by non-African companies on African exchanges. Debt capital markets (DCM) transactions analysed include debt funding raised by African companies and public institutions. Overall, $12.7bn was raised in 2015 in ECM activity across the continent. Over the past five years, there have been 441 African ECM transactions raising $41.3bn. 2015 showed a steady overall increase in IPOs of 12 percent in terms of transaction volume and 17percent in terms of US dollar denominated value, as compared to 2014. However, 72percent of 2015 IPO value and 54percent of IPO volume was carried out during the first half of the year, reflective of the relatively higher levels of consumer confidence as compared to the second half of 2015. Over the past five years, there have been 105 IPOs raising $6.1bn by African companies on exchanges worldwide and non-African companies on African exchanges. 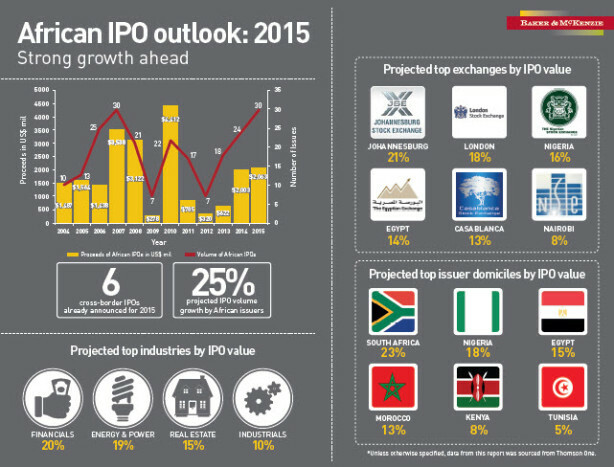 The top 10 African IPOs by value in 2015 took place in South Africa and North Africa, namely Egypt and Morocco. In 2015, capital raised from IPOs by companies on the JSE in US dollar terms decreased by 11percent as compared to 2014, largely due to the weakening of the South African rand during the year; noteworthy is that the rand value of IPO capital raised on the JSE in 2015 increased by 11 percent over 2014 levels. Capital raised from IPOs by companies on other African exchanges in US dollar terms increased slightly by 3percentas compared to 2014. In terms of volume, the JSE saw a 33 percent increase in the number of IPOs as compared to 2014, and listings on the JSE’s AltX more than doubled. Over the past five years, the JSE has led African exchanges in terms of IPO transactions and capital raised, at $2.7bn. In second place in terms of IPO transaction volume after the JSE was the Bourse de Tunis with 23 issuances, while in second place by capital raised was the Egyptian Exchange with $861m. In third place in terms of volume was the Casablanca Stock Exchange with 7 issuances, and third by capital raised was the Nigerian Stock Exchange with $751m, over 70% of which relates to 2014 SEPLAT IPO. Since 2011, capital raised from IPOs by companies on the JSE represented 45% of the total African IPO capital and 33% of the total transaction volume. Over the past five years, there have been 336 FOs raising $35.2bn by African companies on both African and international exchanges. “Though the growth rate of 2015 FO activity did not match that of the prior year, the trend remained distinctively positive,” adds Andrew Del Boccio, PwC Associate Director, Capital Markets, South Africa. During 2015, FO activity increased by 20% in terms of transaction volume and by 13% in terms of US dollar value as compared to 2014. In 2015, capital raised from FOs by companies on the JSE, specifically, increased by 17percent (in US dollar terms), whereas proceeds from FOs on other African exchanges decreased by 30percentfrom $1.2bn in 2014 to $827m. Over the five year period, the vast majority of FO activity was from sub-Saharan African countries, with 76percent and 86percent of total FOs volume and value, respectively. Between 2011 and 2015, capital raised from FOs by companies on the JSE represented 85% of the total African FO capital raised and 67% of the total transaction value. Over this period, in second place in terms of both FO volume and value was the Egyptian Exchange followed by the Nigerian Stock Exchange. On a sector basis, FOs were slightly lower than the five-year average in the financial sector during 2015. There was a significant increase in the technology sector from 7percent on average to 23%, driven largely by a December rights issue by Naspers. African DCM activity has declined since its peak in 2013. Over the past five years, 489 debt transactions took place on African debt markets or, more commonly, by African companies on international markets, raising $110.2bn, of which 72percent was US dollar-denominated. The average of proceeds raised in 2015 was $411m per transaction, $85m higher than 2014’s average of $326m and 83precent higher than the average per transaction over the past five years of $225m. Darrell McGraw, PwC Nigeria Capital Markets Partner, says: “Despite challenging economic times, which are felt heavily in Nigeria, 2016 will be pivotal as companies will be looking to reassess their strategies, which may include divesting of non-core businesses. According to Richardson, Growth across the African continent will require continued investment in various sectors including infrastructure, agriculture, financial services, and telecommunications, alongside other industries more traditionally associated with Africa. In 2015, the capital markets reflected this continued need for investment and continued appetite from investors with key portfolio allocations targeted toward emerging and frontier markets.